The State Library of Victoria is delighted to announce the acquisition of two extraordinary Persian manuscripts following a successful public appeal for their purchase. The State Library of Victoria Foundation launched the appeal to raise $100,000 to acquire a 16th-century manuscript copy of the Khamsa or quintet of classic Persian stories written by the 12th-century Persian poet Nizami of Ganja and a 19th-century manuscript copy of the Tutinama or ‘Book of the parrot’. ‘Through the generous and enthusiastic support of the Victorian people, these superb manuscripts, that have special significance for the state’s Iranian and Indian communities, are now part of our collection. They will be enjoyed by Victorians today and for generations into the future. We are delighted and grateful that the appeal has reached in excess of the $100,000 target’, explains Sue Roberts, CEO and State Librarian. The appeal coincided with the free landmark exhibition Love and Devotion: From Persia and Beyond at the Library which attracted more than 102,850 people over nearly four months. The exhibition closed on Sunday 1 July. Love and Devotion brought to Melbourne over 60 beautiful examples of Persian handmade illustrated books from the collections of the Bodleian Libraries at the University of Oxford to create the largest exhibition of Persian manuscripts in Australian history. ‘Both the appeal and the exhibition generated great public interest, not only from people within the Persian community or those that have an interest in Persian history, but from a broad cross-section of Victorians who came to see this international exhibition. We are very pleased that the exhibition appealed to people from a range of cultures and backgrounds’, Ms Roberts continued. Reflecting the popularity of Love and Devotion, the Foundation welcomed more than 100 new members over the exhibition period and a magnificent book published in conjunction with the exhibition sold out last week. These rare Persian manuscripts will be added to Australia’s finest Rare Books Collection at the Library. The Khamsa manuscript was made in Astarabad, known today as Gurgan, in north-east Persia in 1509–10 by the scribe al-Abd Ibrahim. It is decorated in the Shiraz style with 15 full-page hand-painted illustrations by an unnamed artist (identified by scholars as ‘Artist B’). The work of this artist is found in manuscripts of the same period in the Freer Gallery of Art at the Smithsonian Institution in Washington, in the India Office Library in London, and in the Bodleian Libraries at the University of Oxford. 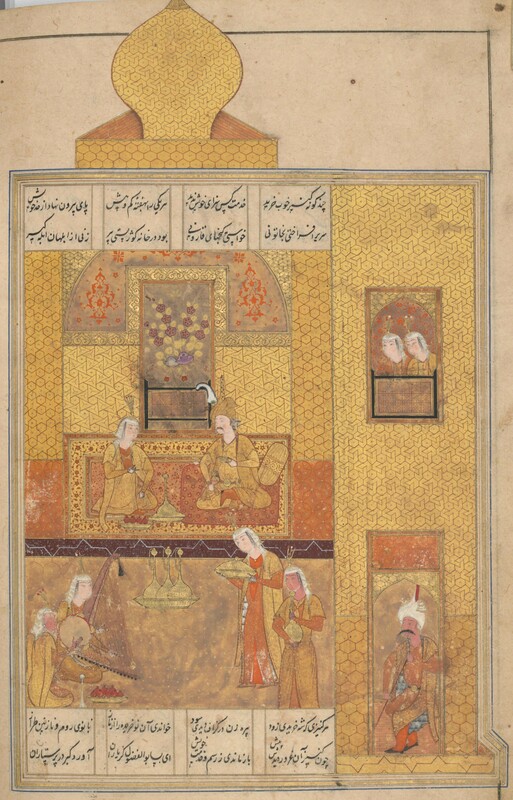 The book comes from the high point of Shiraz-style painting. The Tutinama or ‘Book of the parrot’, is a collection of 52 moral tales told by an enterprising parrot to distract his mistress from her lover during the long absence of her husband. The story was taken from an ancient Sanskrit tale and translated into Persian around 1335 by Ziya’ al-Din Nakhshabi, a Persian physician and Sufi mystic who served at the court of a pre-Mughal Islamic ruler in India. Made in 1808–09 in northern India, it is a beautiful example of how the tradition of the handmade Persian book continued into the 19th century. Complete manuscript copies of the Tutinama are very rare and this will be the only copy in an Australian collection. After seeing their portraits, Prince Bahram Gur falls in love with seven princesses from the seven regions of the known world. On becoming king he marries all seven and builds each her own residence, visiting them in turn on a different day of the week.